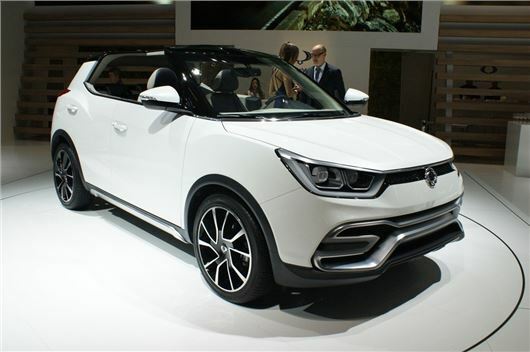 SsangYong has taken a step closer to showing us its new baby SUV by unveiling two concept cars at the Paris Motor Show. The production-ready concepts - the XIV-Air (above) and XIV-Adventure (below) – tell us a bit more about the new X100, which is expected to get its full debut next year. Looking to go head to head with the Nissan Juke, the South Korean manufacturer has come up with a car that closely resembles the Juke’s chunky styling but with wrap-around headlights. The XIV-Air follows in the footsteps of the Vauxhall Adam Rocks Air and Fiat 500C and should sit below SsangYong’s Korando. Both cars are powered by either a 1.6-litre petrol or 1.6-litre diesel engine, both of which meet strict Euro 6 emission standards. They measure 4195mm in length and have a 2600mm wheelbase. And just in case you were wondering, the XIV stands for ‘eXciting user-Interface Vehicle'.